O: This is like Black Note on roids. I can't believe it doesn't garnish the same following. 12oz bottle from Techichi (thanks man!). No bottling info but I believe this was a recent release. Served in a Burnt Hickory snifter. Pours oil black with a finger and a half of pale chocolate milk hued head. The froth fades, leaving a thin halo and some nice large clumps of lacing. Smells of chocolate, bourbon, vanilla and some dark roasted malts. The taste is smooth and well rounded. Chocolate, soft bourbon, dark fruits, vanilla, singed oak, mild smoke, creamed coffee, molasses and a breath of alcohol heat. The barrel flavors are obvious but not as abrasive or overwhelming as several I've tried. The great base beer is still there as well but with a nice new level of sweet complexity. Creamy, medium full feel with moderate carbonation. A little more booze heat comes through in the aftertaste along with chocolate, bourbony vanilla and a bit of smoke/ char. Community has another great beer here in Barrel Aged Legion. Given how much I enjoyed the base I was expecting a little more from the barreled version but that's not to say that this is in any way a disappointment. A quite enjoyable brew and I'm happy to have a few more for future consumption. Try it if you see it. I'm surprised more people aren't talking about this one. Outrageously easy to drink for 11.6%(! ), this was a highlight from my recent trip to Texas. Here's hoping this someday gets the credit it deserves! Black with two-fingers of dark tan froth. Smells sweet and inviting with obvious notes of milk chocolate, currants and vanilla. Tastes of dark fruits, oak and fusel alcohol wrapped in more milk chocolate, faint bitter chocolate, caramel and vanilla. This one is never cloying. As smooth and creamy as they come with a medium body and an unexpectedly dry finish. It gets a bit syrupy and even slightly medicinal as it warms. Delicate but not weak. Refined but not soft. Just the near perfect marriage of a grand Imperial Stout and a whiskey barrel that makes you wonder how we lived without barrel aged beers in the first place. Spectacular appearance. The beer poured a medium viscosity dark brown/black and was topped by a super tight and creamy, three-finger tall, cappuccino colored crown that slowly dropped to a lasting cap of foam. A thick blanket of lacing deposited a drippy wall all down the glass. The aroma was mesmerizing. Bourbon notes dominated. Super smooth and fragrant. This was a total bourbon bomb. Loads of punchy vanilla too. Bit of powdered cocoa. Fairly sweet yet balanced. A hint of roasted malt came through as well. Fairly simplistic overall but so amazing. The flavor profile was excellent but not quite as smooth as the nose. Malty and somewhat sweet on the front end. Good amount of bourbon. Touch of vanilla. Dark chocolate came through in the center. Espresso was noticeable on the back end. More bourbon as well. The beer finished with lingering notes of charred malts and just a hint of booziness. At nearly 12% ABV, however, the alcohol was remarkably well hidden. Outstanding mouthfeel. Nearly full bodied for the style. Amazingly rich, creamy and smooth on the palate. The liquid contained a super fine, frothy effervescence that made the beer feel silky smooth and pillowy soft on the palate. 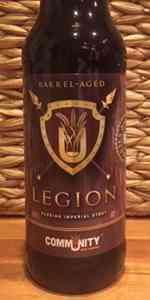 Barrel-Aged Legion is an incredibly fragrant, super tasty and surprisingly quaffable imperial stout that showcases barrel aging in a way that few other beers do. I had never heard of Community Beer Company before my recent trip to Texas, but if their other beers are anywhere near as good as this one then I definitely need to keep these folks on my radar. Good Beer. A bit like a barrel aged porter in body, big coffee on the first sip but opens up to a nice round beer when it warms a bit.